On October 10, 2013, I published the first in what I hope will be a trilogy of Science Fiction novels based on the characters created by Jules Verne in 20,000 Leagues Under the Sea. 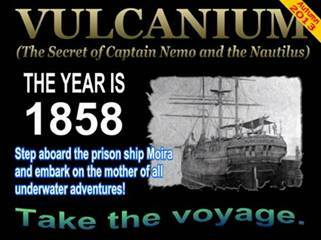 VULCANIUM is the story of Captain Nemo; who he was, how and why he and his renegade crew built the Nautilus, and what events led up to their fateful encounter with the U.S.S. Abraham Lincoln. 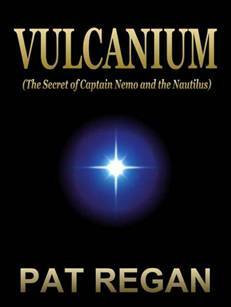 Because 20,000 Leagues Under the Sea is widely perceived as a mix of Verne’s book and subsequent movies; VULCANIUM offers my own take on Nemo’s origin, the energy driving his submarine, and the identity of that hated nation in an homage to Verne and Disney geared to contemporary audiences Worldwide. While some critics have felt secure in labeling Nemo a madman, I have always perceived him as a peaceful but persecuted individual; given to militant pacifism and ultimately driven to mayhem in his own defense. Seen in that light, he might not seem so different from the rest of us. In telling Nemo's story, VULCANIUM exposes man’s inhumanity to man; explores the arcane corruption and self-destructiveness of human societies; and asks whether archaic notions about war are still relevant to modern times. Published through Outskirts Press of Denver Colorado, VULCANIUM (The Secret of Captain Nemo and the Nautilus) is 382 pages in length; printed on premium grade paper; hardcover with color dust jacket; and is identified by the ISBN number 9781478700005. The book and additional information are available through the following publisher's link at booksellers like Amazon, Barnes and Noble, etc.